More bad news for Avonmouth residents as another POLLUTING PLANT appears at the Port of Bristol overnight without planning permission and, apparently, with the support of compliant government regulators and Bristol City Council. A temporary CONCRETE BATCHING PLANT and manufacturing facility at Avonmouth, which will be used to make concrete segments to form the water intake tunnels for the new Chinese funded nuclear power station at Hinckley Point, is up for retrospective approval by a Bristol City Council planning committee in May. As usual in Avonmouth, it appears the plant has ALREADY been built by contractors HANSON and is ready to start production. Locals are said to be less than impressed with this latest example of the council’s CAVALIER APPROACH to their wellbeing. The Reverend Rees even made a PR friendly visit to the Merchant Venturer-run Port just last month where DEVELOPMENT ISSUES and POLLUTION weren’t even mentioned by the Reverend or his entourage as they posed for photos for the press. 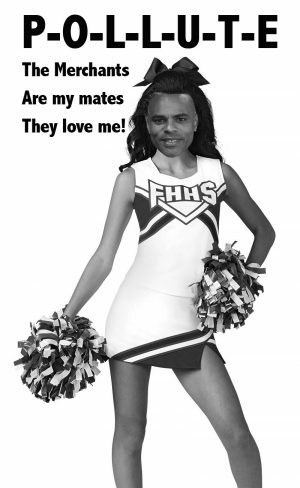 Instead the mayor played CHEERLEADER for the Port’s apprenticeship scheme and generally brown-nosed the management of the Port for providing employment. Concerns of residents and locals did not feature. This latest cosy planning arrangement between Bristol City Council, the Port of Bristol and MULTINATIONAL POLLUTERS comes just a few months after the Day Group won an appeal with the Planning Inspectorate to run a poisonous waste processing plant on Port land without any planning permission. Welcome to the latest regulatory failure and corporate stitch up of Avonmouth residents. This entry was posted in News and tagged Bristol City Council, Bristol Port Company, Concrete batching plant, Day Group, Environment Agency, Hanson, Hazardous substance consents, Hinckley Point, Marvin Rees, Port of Bristol, Society of Merchant Venturers on May 15, 2018 by thebristolblogger.